Professor Sankaran is an award-winning teacher and master percussionist specializing in the traditional South Indian drum, the mrdangam. He is credited with having raised the mrdangam and kanjira to the status of solo instruments. Trichy Sankaran appears in solo performances and broadcasts both in India and the West, as well as performing regularly with his fusion band, Trichy’s Trio, and other Karnatak artists in North America and on concert tours in India. He also performs frequently with jazz, electronic and African music ensembles, and is well-known for his compositions for Toronto’s contemporary gamelan ensemble, The Evergreen Club. He has concertized on four continents with Nexus and World Drums, and has played in numerous individual collaborations with artists such as Anthony Braxton, David Rosenboom, Pauline Oliveros, Charlie Haden and others. Professor Sankaran’s recordings include Laya Vinyas (1990), Sunada (1993), Lotus Signatures(1997), Ivory Ganesh Meets Doctor Drums (1998) and Catch 21 (2002). He is the author of two instructional books on South Indian classical drumming, most recently The Art of Konnakkol (Solkattu) published in 2010. 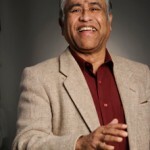 Professor Sankaran has earned numerous awards in both Canada and India for his accomplishments as artist and teacher. His most recent honours are the Toronto Arts Foundation’s 2011 Muriel Sherrin Award for International Achievement in Music and the 2011 Sangita Kalanidhi title and award, bestowed by the Music Academy of Madras, India, for the highest achivement in Karnatak music. In 2005 he was honoured at a special celebration in Mylapore, Chennai, India, for his service to Karnatic music over the past five decades as a global performer, composer, musical collaborator, scholar, teacher and cultural ambassador. He is the recipient of the OCUFA Award given by the Ontario Confederation of University Faculty Associations for teaching excellence, and the Professional of the Year Award given by the Indo-Canada Chamber of Commerce for artistic excellence. He was awarded an honorary Doctorate of Music by the University of Victoria, BC in 1998 in recognition of his contributions to music in Canada and abroad.